The BTL series is one of the best selling lines of lifters from Bayne Premium Lift Systems. 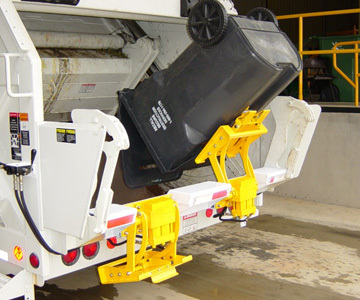 This lifter was specifically designed to offer greater ground clearance for rear load applications, thus reducing the risk of damaging the lifter on uneven terrain such as alley entrances, landfills, etc. This additional ground clearance makes the BTL a perfect choice for rear load applications with commercial container lift bars. BTL lifters may be combined with a vertical assembly to make a VBTL lifter. VBTL models add 9" of vertical travel and 3 1/2" of thickness to the BTL lifter. The BTL 208 series is one of the newest and most advanced lines of cart lifters from Bayne Premium Lift Systems. The patent-pending design of the BTL 208 series incorporates a sweeping action that automatically adjusts for uneven terrain, preventing operators from having to lift carts onto to lifter faceplate. This lifter was specifically designed for rear load applications. It offers greater ground clearance and is thin enough to work in conjunction with commercial container latch kits. 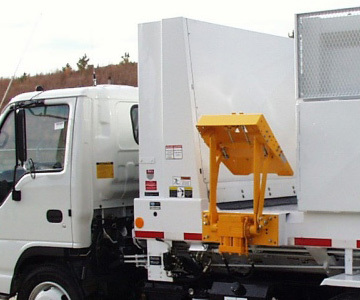 This allows one truck to pick up both residential and commercial waste on the same route. The TL series is one of the best selling lines of lifters from Bayne Premium Lift Systems. This lifter was specifically designed to operate with the fewest moving parts possible, making it the most reliable lifter on the market. TL lifters may be combined with a vertical assembly to make a VTL lifter. VTL models add either 9", 15", 24" or 34" of vertical travel and 3 1/2" of thickness to the TL lifter. The Taskmasterª Cylinder Lift from Bayne Premium Lift Systems was designed for the hauler who is looking for an economical, quality-built cart lifter. 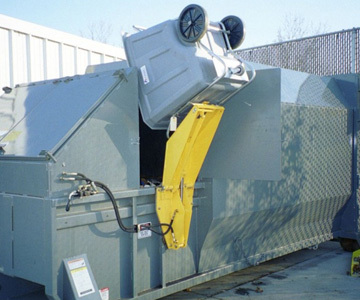 In addition to collection vehicles, the Taskmaster can be mounted on a stationary frame or compactor to offer a safety conscious solution for a wide variety of material handling applications. 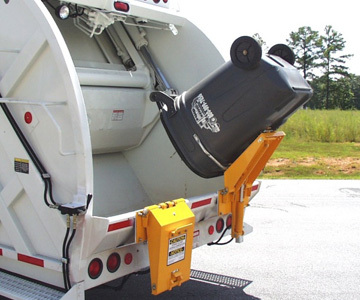 The Taskmasterª Hi-Lift from Bayne Premium Lift Systems was designed for the hauler who is looking for an economical, quality-built cart lifter. 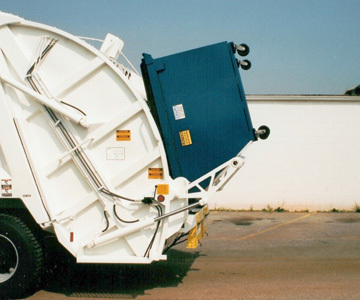 In addition to collection vehicles, the Taskmaster can be mounted on a stationary frame or compactor to offer a safety conscious solution for a wide variety of material handling applications.